The hotel interior offers a classic fusion of oriental and french colonial charm, whilst still offering guests modern day requirements. The spacious rooms at Indochine Pavillon are fitted with wooden flooring and traditional French Khmer-style décor. A flat-screen cable TV and tea/coffee making facilities are provided. 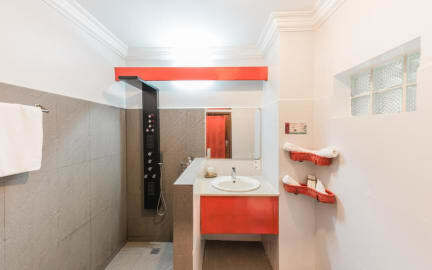 Each room has a safe and private bathroom with bath amenities and hot shower. Day trips or tour sightseeing can be organized at the front desk, which also offers ticket service. They can also assist with car rentals. 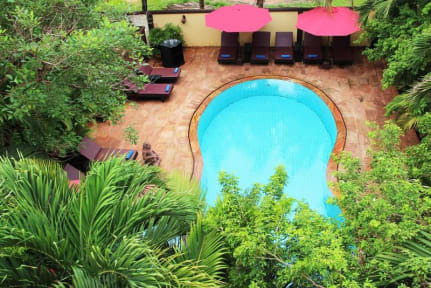 To relax, guests can take a leisurely swim at the outdoor pool, have an aromatic massage or visit the internet cafe. 4. Payment upon arrival by cash. Credit card is accepted. Visa or Master or Union pay. 5. Reception working hours 06:00-22:00 and after we do have a night man to stand by in case the guest need.